This is the stationary on which the printer made a mistake – using a q instead of a g. I thought you wouldn’t mind if I used it for writing to you. I worked until after one o’clock last night. Dad wanted some new sheets for the appointment book and I cut stencils and after club yesterday ran them off on the mimeograph – 500 sheets run thru twice. I brought them home and had to run the dates in on the typewriter. Dad left the office early to go to Lafayette to a hospital meeting. I worked on the project until time to go to a meeting I had planned to attend. After I came home I resumed the project and finished it. 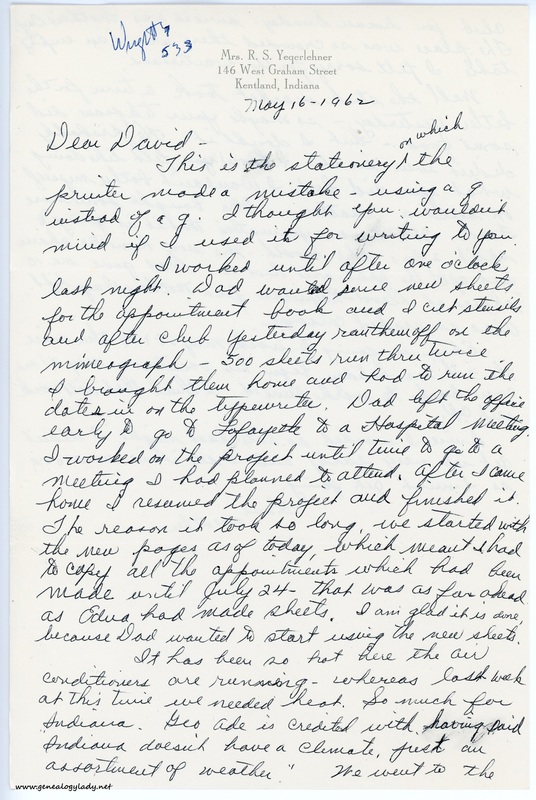 The reason it took so long, we started with the new pages as of today, which meant I had to copy all the appointments which had been made until July 24 – that was as far ahead as Edna had made sheets. I am glad it is done, because Dad wanted to start using the new sheets. 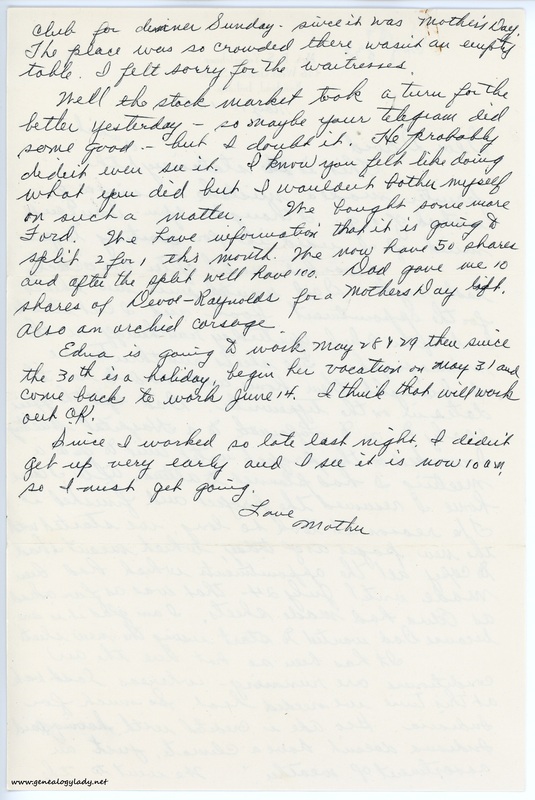 [page 2] club for dinner Sunday – since it was Mother’s Day. The place was so crowded there wasn’t an empty table. I felt sorry for the waitresses. Well the stock market took a turn for the better yesterday – so maybe your telegram did some good – but I doubt it. He probably did even see it. I know you felt like doing what you did but I wouldn’t bother myself on such a matter. We bought some more Ford. We have information that it is going to split 2 for 1 this month. We now have 50 shares and after the split will have 100. Dad gave me 10 shares of Devoe-Reynolds for a Mother’s Day gift. Also an orchid corsage. Edna is going to work May 28 & 29 then since the 30th is a holiday, begin her vacation on May 31 and come back to work June 14. I think that will work out OK. Since I worked so late last night I didn’t get up very early and I see it is now 10 a.m. so I must get along. 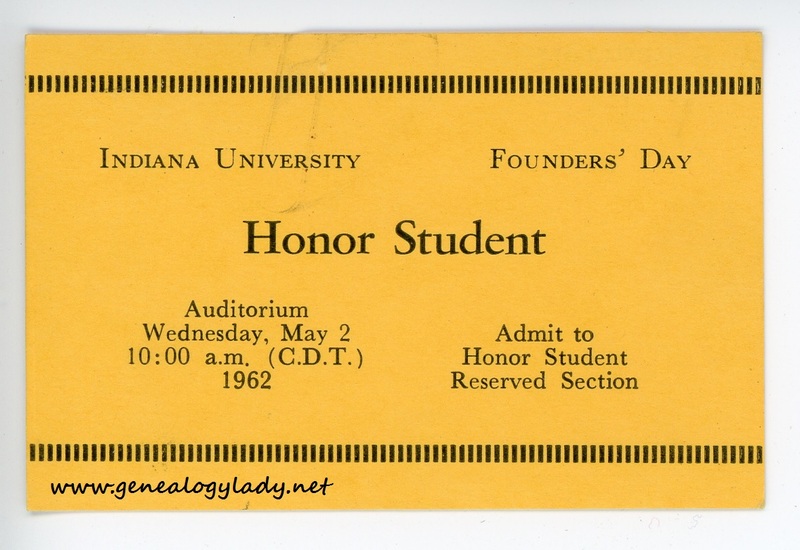 This entry was posted in Genealogy, Yegerlehner and tagged 1960s, David A. Yegerlehner, genealogy, George Ade, Gladys R. (Foster) Yegerlehner, Indiana, Indiana University at Bloomington, Kentland, Roscoe S. Yegerlehner, Wright Quadrangle on October 15, 2016 by Deborah Sweeney. Far worse things have been done to Yegerlehner than a “q” !!! What a chore that appointment book was in 1962! “so maybe your telegram did some good – but I doubt it. He probably did even see it. I know you felt like doing what you did but I wouldn’t bother myself on such a matter.” I have no idea. Another of history’s mysteries.